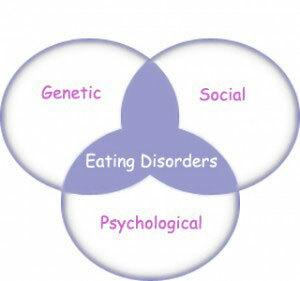 Eating disorders such as Anorexia Nervosa, Bulimia Nervosa, Avoidant/Restrictive Food Intake, and Binge Eating Disorders include extreme eating, dieting and compensatory behaviors. While many think these disorders are a reflection of vanity or ones obsession with appearance, the opposite is true. Those struggling with eating disorders may exhibit behaviors consistent with the above however these are symptoms of a much more serious and deadly illness. Read below to learn more about the specific disorders. Anorexia Nervosa is characterized by self-starvation and excessive weight loss. Currently it is believed that approximately 90-95% of anorexia nervosa sufferers are girls and women, however this is under debate. Between 5-20% of individuals struggling with anorexia nervosa will die, however it is believed that this number is declining as treatment options have become increasingly available over the last decade. It should be noted that the probabilities of death increases as the illness progresses. Anorexia nervosa has the highest death rates of any mental health condition. The onset of diagnosis has been shifting over the last decade, previously, anorexia nervosa appeared in early to mid-adolescence, however there has been a recent increase in first time diagnosis in those over the age of 30. Intentional restriction of food intake leading to weight loss and/or the maintenance of a unhealthy low weight. Intense fear of weight gain, obsession with weight and excessive efforts to prevent weight gain. Inability to appreciate the severity of the situation. Purging Type involves compensatory behaviors such as purging, exercising or laxative abuse in response to eating even “normal” amounts of foods. Restricting Type does not involve compensatory behaviors. (Previously referred to as “Feeding disorder of Infancy or early childhood) While the diagnosis of ARFID is not a new, patients meeting the criteria for diagnosis over 6 years of age would have been assigned a diagnosis of EDNOS. This was due to the criteria set in the previous diagnostic and statistical manual DSM-IV-TR which required the onset of symptomatology prior to the age of 6 years. Changes to the criteria now include the diagnosis of those of all ages. Concern about aversive consequences which can include somatic response such as a sick stomach. The diagnosis also requires that the lack of intake is not the result of food availability, a medical or other psychiatric condition or related to religious or cultural practices. Due to the previous exclusion of diagnosis for those above six years of age, less is known about the disorder (as compared to others in this category) but as a general rule of thumb a differential diagnosis between ARFID and Anorexia should consider the onset, progression and duration of symptomatology. Additional caution should be taken regarding the belief that those with the disorder always present with an “absence of body image disturbance” as it should be recognized that past research has identified the potential for severely malnourished individuals (regardless of reasoning) to experience symptoms more consistent with a diagnosis of Anorexia. Differential diagnosis should explore whether body image distortion or dissatisfaction predated intake restriction rather than if the patient currently presents with this symptomatology as it could be secondary to the malnutrition. A final note: It can not be stressed enough that a misdiagnosis of ARFID, may prolong or worsen outcomes of treatment as the presentation of ARFID is primarily somatic and some treatments (as well as settings) could cause additional distress and worsen symptomatology. That is to say, most patients presenting with ARFID are poorly served on highly structured mixed inpatient units or by providers who approach the disorder with the mindset that these patients are in denial, secretive or otherwise non-compliant. Binge eating disorder (BED) is characterized by recurrent episodes of binge eating (eating large quantities of food) usually over a short period of time without the use of the compensatory behaviors present in Bulimia. The binge often leads one to feel out of control, experiencing shame, distress and/or guilt. The binge eating is not associated with the recurrent use of inappropriate compensatory behaviors (e.g., purging) as in bulimia nervosa and does not occur exclusively during the course of bulimia nervosa or anorexia nervosa. For more information click here. Bulimia Nervosa is characterized by a cycle of binge eating (eating large quantities of food) usually over a short period of time and followed by compensatory behaviors such as self-induced vomiting, use of laxative or other behaviors to compensate for the binge eating. Bulimia nervosa affects 1-2% of adolescent and adult women.